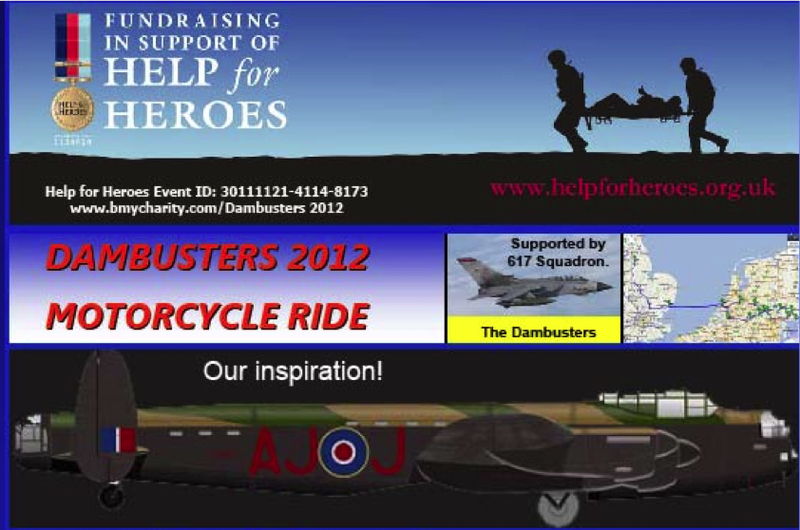 On the night of 16/17 May 2012 the 69th anniversary of the Dams Raid will be marked by a fundraising motorcycle ride for the Help for Heroes charity. The four riders will follow as closely as possible the route flown by 617 Squadron Lancaster AJ- J on the raid, from RAF Scampton to the Möhne Dam. They will then return to the UK via the John Frost Bridge, so famously held by the Paras at Arnhem, the ‘Bridge too Far’, arriving back in Scampton before midnight the same day. The riders plan to lay a wreath at the Möhne Dam at 0019 on 17 May, the exact time and day of the bombing run of the Lancaster piloted by David Maltby. As this blog has a personal connection to David Maltby and his crew, we are happy to support their efforts. The riders are a group of four, led by Simon Dufton. If you would like to support this cause, you can go to the donations page set up by Simon and his colleagues. Lots of technical reasons why it’s taken a week to get this up on YouTube, but here it is. I have never been so close to a Lancaster flypast before, and what caught me by surprise was how low it flew and how quickly it passed. Although we knew the direction in which the aircraft would come, and were prepared for it, the first pass happened so quickly that no one caught it on video. Luckily we were better prepared for the second and third approaches, and my son was able to catch just 22 seconds worth altogether. 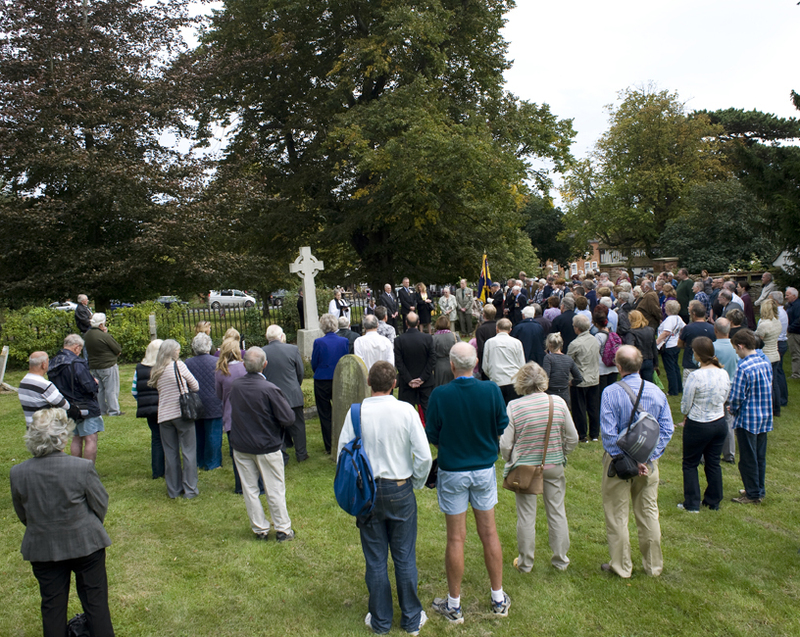 The country’s only flying Lancaster couldn’t make an appearance, but a couple of hundred people were not deterred, and made Saturday’s tribute to the crew of Dams Raid Lancaster AJ-J in Wickhambreaux, Kent, a very special occasion. The village churchyard contains the grave of pilot David Maltby, whose body was the only one recovered from the North Sea when the aircraft he was flying crashed on 15 September 1943. Every year, local people gather to commemorate David and the rest of his crew, who have no known grave. This year, we were privileged to be joined by representatives of the families of three of other crew members, John Fort (bomb aimer), William Hatton (flight engineer) and Victor Hill (front gunner). 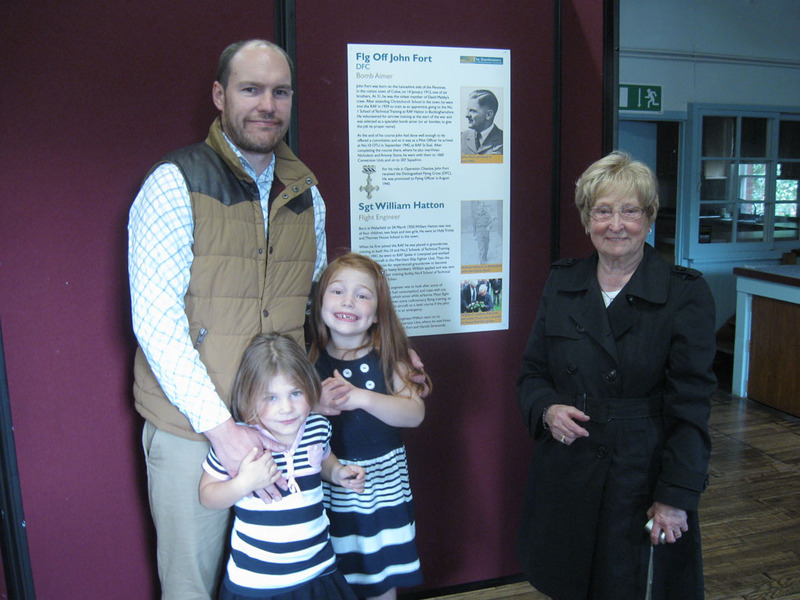 As well as the graveside tribute, a small exhibition took place in the Village Hall, which was opened by the Sheriff of Canterbury, Cllr Hazel McCabe. 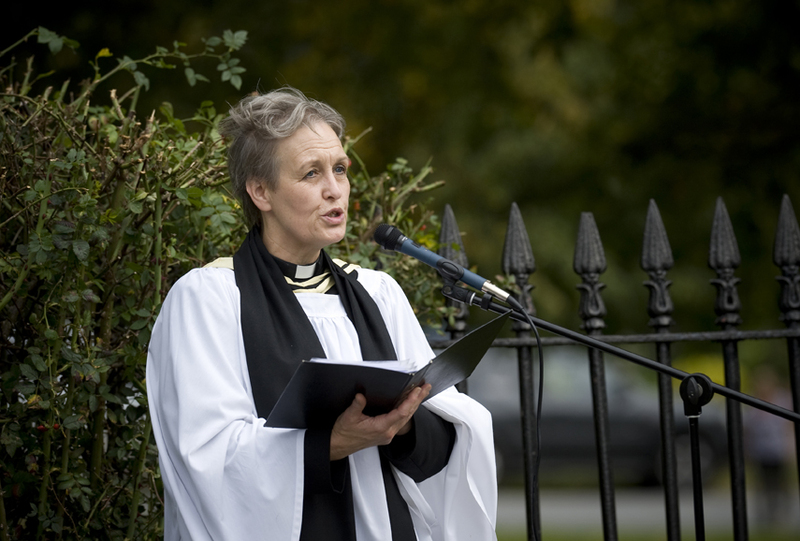 Obviously, people were disappointed that the Lancaster was prevented from flying by high winds (foreshadowing Monday’s gales in the wake of Hurricane Katia) but that did not prevent a very impressive turnout, and a poignant and moving service, led by the Vicar, the Revd Chris Wilkinson. Many thanks to all who came, and to Revd Chris Wilkinson, the Wickhambreaux Parish Council, the Village Hall Committee, the Sheriff of Canterbury and the Rose Inn for their help. Peter Fort, great nephew of Flg Off John Fort, his two daughters, and Rene Hopkins, sister of Sgt William Hatton. 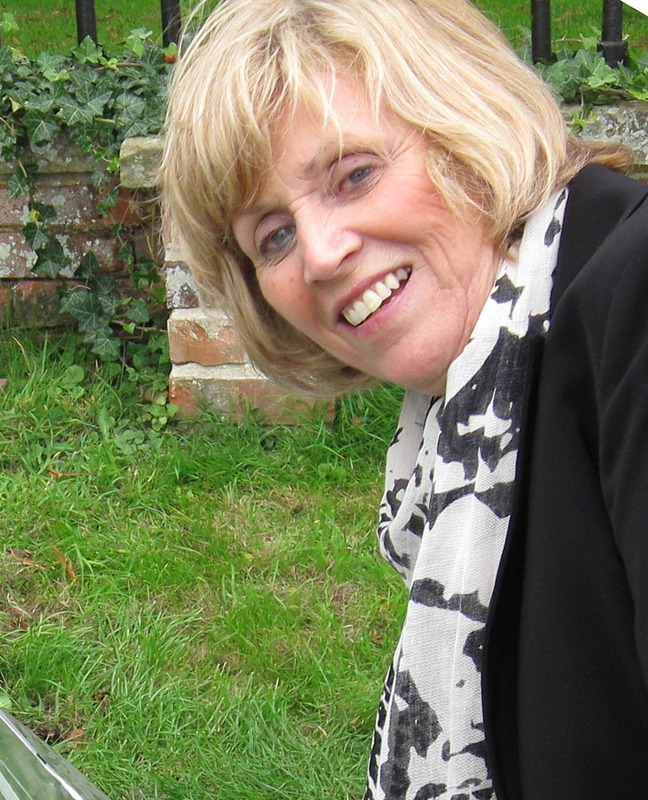 Valerie Ashton, daughter of Flt Sgt Victor Hill. Update from Wickhambreaux, Kent, 2.30pm, Friday 9 September. It’s a fine dry afternoon here, with the weather a bit cloudy, but apparently the forecast for this weekend is for high winds. The BBMF have just contacted me to say that all flying for this weekend has been cancelled. 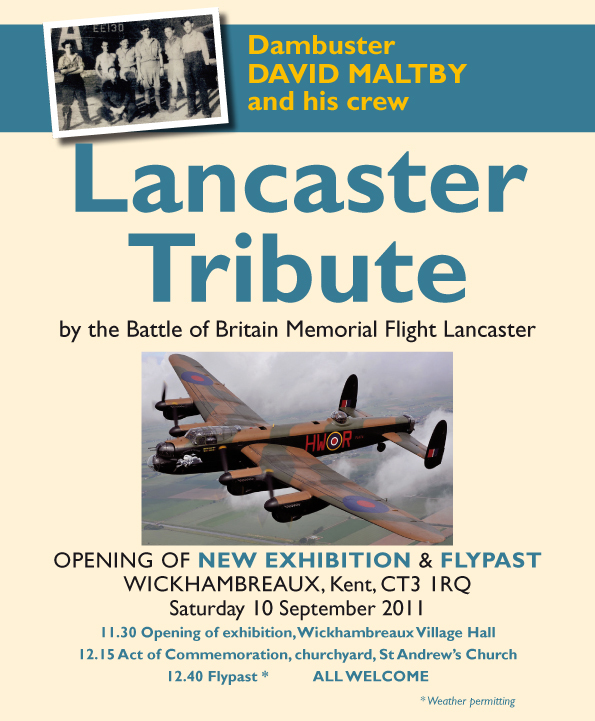 This means that the Lancaster flyover planned for tomorrow (Saturday) has been called off. The aircraft is currently at Manston — 20 or so miles away — and it is likely to fly over us here late this afternoon, so local people will be able to see it. I will post some pictures on the blog as soon as I have them. However, we are going ahead with the exhibition opening followed by the ceremony at David Maltby’s graveside. If you have made plans to come here, please do. Local children have been tidying the grave, and a large local crowd is expected. The families of several of David Maltby’s crew will be here and it will be a great tribute to them. 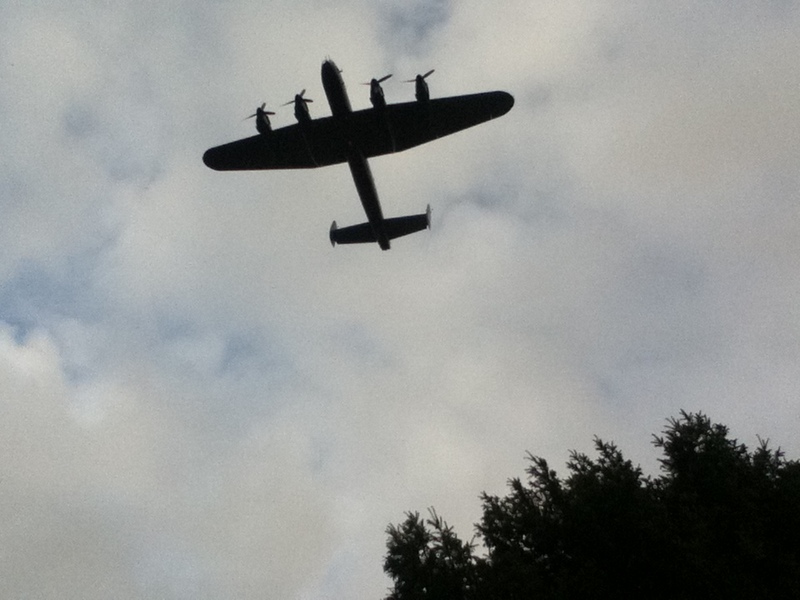 We’ve just had three passes by the BBMF Lancaster – see the picture below. This year, the annual commemoration of Dambuster David Maltby and his crew, which takes place in Wickhambreaux, Kent, has an extra ingredient – a flypast by the UK’s only flying Avro Lancaster. The event takes place on Saturday 10 September, a few days before the 68th anniversary of the crew’s final flight, on an aborted raid on the Dortmund Ems canal on 14 September 1943. A small exhibition describing the lives of all the crew members will be opened in the Village Hall at 11.30am. 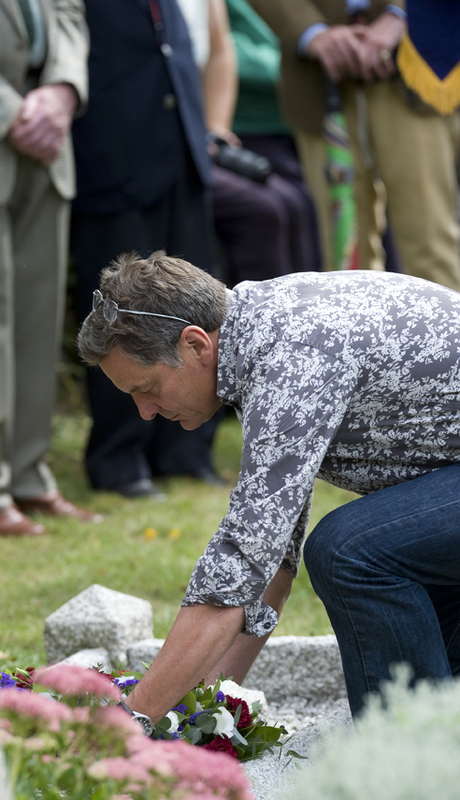 This will be followed by an act of commemoration at David Maltby’s graveside, in the churchyard, starting at 12.15pm. The flyover will take place at 12.40pm, weather permitting. Members of the families of David Maltby, William Hatton and Victor Hill will all be present, and anyone interested is welcome to attend. Wow! Good morning and welcome! I can only attribute it to the Dambusters double header shown on BBC2 last night, but I have just seen the biggest ever single “spike” in views of this blog. Nearly 1300 people found their way here yesterday, and a further huge number this morning, so if you are amongst them, then welcome. This is, as far as I know, the only regularly updated Dambusters blog or website anywhere on the whole interwebnet. I like to think that it’s a good source for information about 617 Squadron’s wartime exploits, and all the things that have flowed from the fact that the Squadron was responsible for the RAF’s single most famous bombing operation of the Second World War. The answer as to when the remake will come out, as I write in October 2010, is that we simply don’t know. 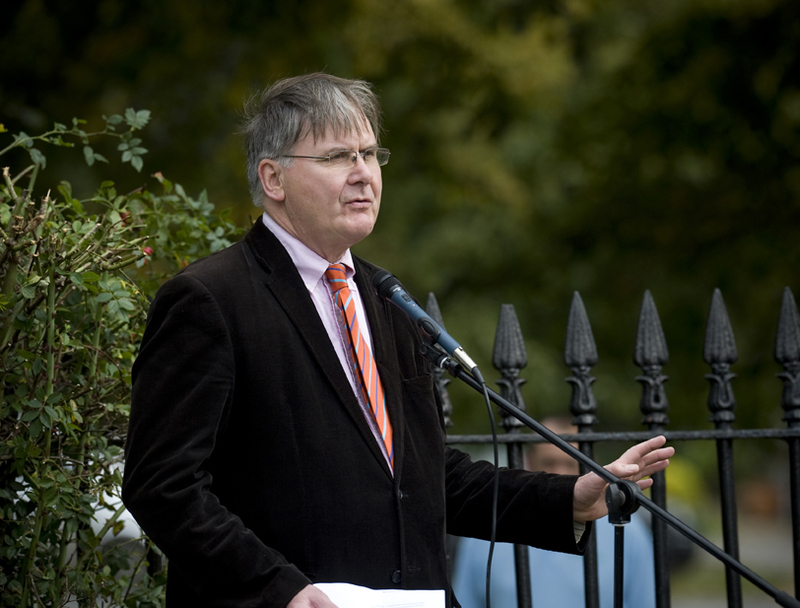 Jackson’s outfit, Wingnut Films, has a code of secrecy akin to that of the Vatican’s College of Cardinals, and all we can say is that he will tell us in his own good time. Finally, you might ask what are my credentials for writing this stuff. I’ve spent all my working life as a writer, editor and designer, but I have a family interest in the Dambusters. My uncle was David Maltby, pilot of the fifth aircraft to attack the Möhne Dam on 17 May 1943, dropping the bomb which caused its final breach. (He is played in the 1955 film by none other than George Baker, then an unknown young actor.) Sadly, David was killed four months after the Dams Raid, along with all his crew, when their aircraft crashed after being recalled from an aborted attack on the Dortmund Ems canal. In 2008, I wrote a book about David, his life, and the lives of his crew and the effect that their deaths had on all their families which is, as they say, available in all good bookshops – or online here. I’d welcome your comments, news and any other information you want to share. Members of three Dambuster families came together earlier this week to mark the anniversary of the deaths of their relatives. Pictured above are (far left) William Castle, nephew of Sgt William Hatton, (third from left) Rene Hopkins (sister of Sgt William Hatton) and (second from right) Valerie Ashton (daughter of Flt Sgt Victor Hill). 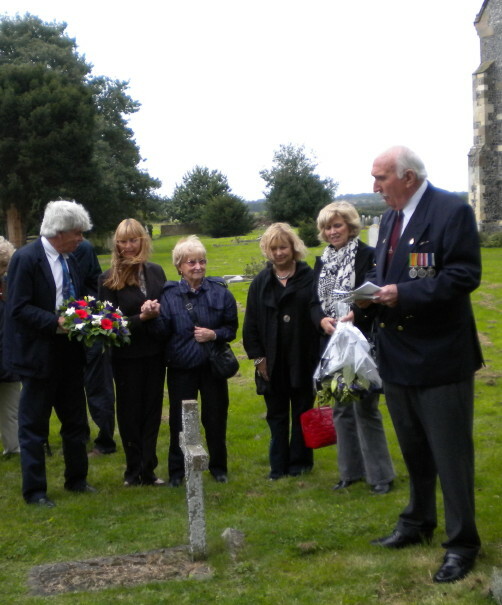 They are gathered at the graveside of Sqn Ldr David Maltby, in St Andrew’s Church, Wickhambreaux, Kent for the annual commemoration of the deaths of this Dams Raid crew after an aborted raid on the Dortmund Ems Canal in the early hours of 15 September 1943. David Maltby’s body was the only one recovered after their aircraft went down – those of the rest of the crew were never found, and they are commemorated on the Runnymede Memorial. The accident may have been caused by a collision with a Mosquito of 139 Squadron returning from a completely separate raid on Berlin, but this has never been proved. The commemoration was organised by the East Kent branch of the RAF Aircrew Association, whose chairman, John Addley, is on the far right.